November 28, 1997. 1000 - Point San Pablo Harbor. We sat in the cabin completing the necessary paper work to transfer ownership of Pegasus to Jo and I. It had rained a few day's before and the cushions and sole were still damp and a heavy smell of stale exhaust fumes and mildew permeated the air. After an exchange of paperwork and money, Jo and I started loading supplies (mostly food, emergency and safety items) for the 2 day journey to Owl Harbor Marina in the California Delta. A location selected because of its quick access to home, parts, supplies and, a place where I could work on the boat without disturbing anyone (plus, the price is right). After saying our good-byes, Jo returned home by car while I started checking out the boat and making temporary repairs to the mainsail. Jo and I have always been trailer sailors. We had a Lyle Hess designed Balboa 26 and enjoyed trailering it to many interesting locations that a Triton could reach only with a hassle. This was certainly going to be a down side for the Triton however, I wanted a boat for coastal cursing that I could feel comfortable with. My requirements for such a boat were simple; 1 - It had to be a project - something I could play with and enjoy during the non sailing months; 2 - It must be easy to single hand as I frequently sail alone and, 3 - it must be capable of being trailered with no greater than a ton vehicle. Actually, I did one of those analysis type things where you write down all your likes and dislikes then start researching boat spec's until you identify 3 to 5 boats that meet those requirements - then you start walking the docks and reading the classifieds (this was the fun). I'll spare you the rational and just say that after months of research and looking at boats (east & west coast) that met my particular requirements, the Pearson Triton became my design of choice and Pegasus my project. Her hull was solid and would require little work. 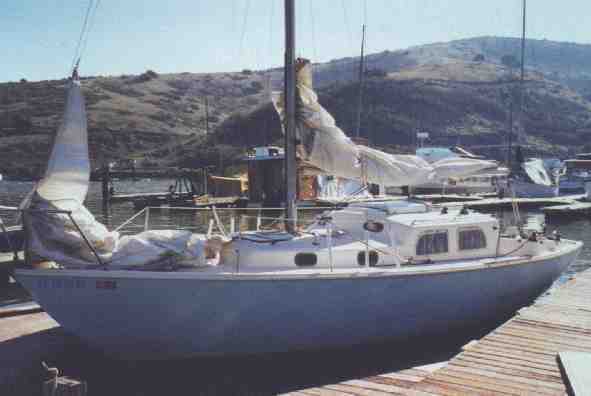 Also, being a "Sausalito Triton" her decks are reinforced, solid FRP so core rot would not eat up a lot of play time and, although the decks look ever bit of their 37 years, crazing and voids are minimal and can easily be repaired when weather permits. Pegasus's power options include a rebuilt Atomic 4 with approximately 40 hours (another plus), a main, genoa, working jib, club jib - with hardware and, a very tired spinnaker. 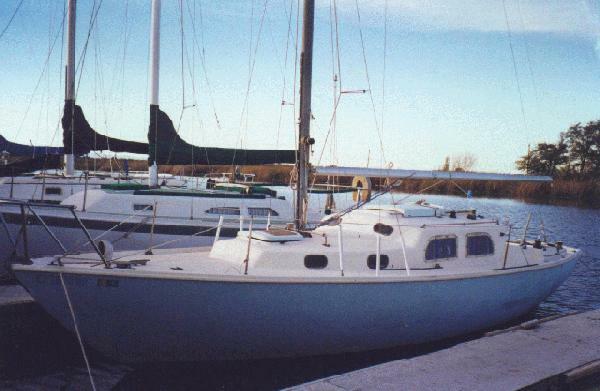 The white sails were designed for racing and manufactured by Mitchell Sails of Sausalito in 1978 and will be more than adequate for the type of leisure cruising Pegasus will enjoy in the immediate future. The Rigging is not in the best condition and the interior is the real project. Pegasus is exactly what I had been looking for. 1145 - Jack, the Harbor Master at Pt San Pablo Harbor, advised me to clear the channel no later than 1200 hours to ensure adequate depth on the current ebb. Waiting longer would mean spending another day and catching tomorrow's high tide. Excited with our new toy and never having the opportunity to sail a Triton, any reason to leave quickly was music to my ears. I cleared the channel, set sail in light winds and took the time to aquatint myself with Pegasus. Her characteristics were everything I had expected from hours of reading about Karl Alberg's Triton. 1400 - With the wind on my nose and wanting to make Vallejo before nightfall, I started the engine and began motor sailing to pick up time lost playing. 1420 - Engine stalled. Sounded like it ran out of gas. I reached down and touched the started and the engine restarted in a heartbeat. 1435 - Engine stalled again. My project started earlier than expected. I trimmed the sails so Pegasus would take care of herself and went below to look for the problem. Without an engine I would arrive much later than expected and have to sail a strange boat into a strange slip (something I was NOT looking forward to) or, spend the night on the hook (safer option). 1445 - Problem located. It was similar to a problem I had with my first car - a 1939 Pontiac purchased for $50 while in high school. Pegasus's built in fuel tank had 37 years of lacquer build-up that was flaking off and clogging the fuel filters (1 in-line and 1 spin-on). I rapped on the filters to jar the flakes loose and allow the fuel to flow. The engine started again and ran fine - as long as I did not over rev it and, I continued to rapped on the the filters every 5 min. 1720 - Channel marker #7 - Getting dark - I turned on the navigation lights and everything worked just like it did during the check out, RIGHT ? - WRONG. Stern and steaming lights not on. So much for check outs. Checked the fuse and it was ok however, the fuse block was badly corroded and the wiring was too difficult to inspect while sailing in the dark. Placed a flashlight in the main sheet pointing aft - looks good to me. Its pretty lonely out here tonight so I'll shut the engine down if it should get busy - steaming light not required. (Note - later inspection at dock revealed untinned wires corroded and broke at the fixtures). 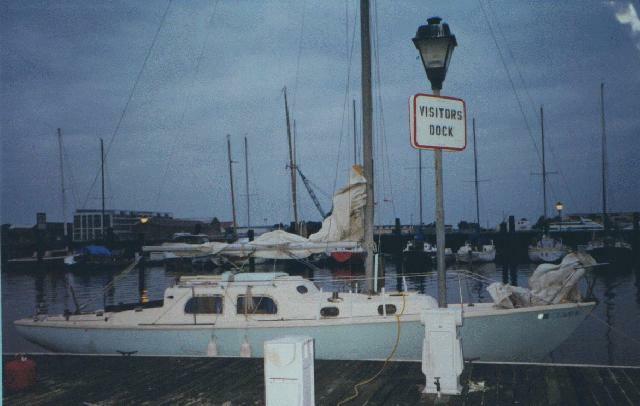 1945 - Vallejo’s Visitors Dock was empty so I took the end tie. It looked like a football field - you could have sailed an aircraft carrier into this slip. After calling Jo to let her know everything was OK (more or less), I heated up some Trader Joe’s black bean chile and poured myself a glass of BV Cabernet Jo had bought for my maiden voyage. What a meal (I'm easy). Being wide awake and still excited about the new toy, I started going through every locker and scanning every shelf and compartment. Water and junk was everywhere. After taking 4 thirty gallon trash bags to the dumpster, and filling another bag half full, I decided to call it a day before it turned into another. November 29, 1997. 0830 - I paid my slip fee's and headed for Yacht Masters in search of new fuel filters. What a deal, only $25 bucks (These Atomic 4's are sure more fussy than the Honda outboard I was use to). I installed the filters then cleaned the fuel system the best I could with limited tools. I allowed the engine to run while I checked and doubled checked for leaks (us outboarders are paranoid about inboards). Finding no problems, Pegasus and I started down the Mare Island Straits heading for the Carquinez Straits. The weather man was promising a weak front with winds 10 to 15 out of the SE. Wind, heavy river current from El Nino rains and a strong flood made the straits bumpy and a little wet (If I were in the Balboa, I would have waited out the tide change in Vallejo) but Pegasus, with new filters, was enjoying a new life as she plowed through the chop without missing a beat. I was starting to eat the many words murmured the night before about an Atomic 4. 1445 - City of Antioc - Still an east wind and still no hiccups. As the San Joaquin River turned northeast I set the main, shut down the engine and again enjoyed a leisurely sail. I've sailed this route many times but for some reason, today seemed special. The air was crisp and fresh and migratory birds circled overhead breaking the silence enjoyed by being the only boat on the river. Fall in the Delta, is one of the California's best kept secrets. Although the Delta is mainly known for its warm summer days, Spring and Fall are special for me. Winds are generally light to ensure you don't hurry through life any faster than necessary; vacationers have gone home for the season; your on the water with just a few old river rats trying to catch the last stripper and; your bundled up in your fleece and know why the smell and taste of a hot cup of coffee was put on earth. At Sevenmile Slough I secured the sails and motored slowly through the quite waterway toward the Marina, occasionally coming to a near stop for water foul loudly questioning my intrusion into their winter feeding grounds. 1700, Owl Harbor Marina, Dock I, Slip 12 - Jesse came out of his house boat to greet me and invite me inside to warm up and exchange stories about our Thanksgiving weekend. Jesse is a fixture around Owl Harbor. In his late 80's, he is very alert, active and always has a story to tell and a hot cup of coffee to offer. We commonly referred to him as the I-Dock Commodore and he's deserving of the title. He watches his charges with diligence noting any problems for the next time he sees you. I brought him a piece of cake Jo had made and we talked for about 15 minutes before I walked to the Harbor Masters office to call Jo and let her know that Pegasus had landed. November 30, 1997. 0230 - I awoke to water dripping on my forehead - It was raining and I had turned in early with all hatches wide open. I secured the hatches and put on some water for a hot cup of cocoa then sat down and again looked over the new toy. I tried to envision how different modifications to the interior would look but could hardly stay awake - back to the sack. had a water tank built into the bilge. In this configuration, water from leaks (or condensation - and Pegasus had a lot of both) enters the forepeak then drains through the foc'sle bulkheads onto the sole. Form there, it drains onto the head sole, which in turn drains into the main cabin before entering a small bilge area near the aft bulkhead. There just happened to be a low spot on the cabin sole where my feet were taking a morning bath. As for the bilge pump, the trip had jarred loose sediment that must have been accumulating for years. The sediment, mixed with leaks and an excessively dripping stuffing box produced a mud slurry that the pumps (manual and electric) were having difficulties handling. I decided to have a cup of coffee then clean the bilge and pumps before Jo arrived to pick me up (sounded logical at the time, Balboa's have very a small bilge to speak of and are easily and quickly cleaned). 1030 - Jo arrived and I'm still cleaning the bilge. The check valve for the electric pump didn't work and the manual pump refused to move the liquid peanut butter. We drove to Rio Vista and purchased a new check valve then had a Double Cheeseburger Special at Jane's Drive Inn - You have to keep your priorities straight when when messing about on sail boats. 1530 - With bilge and pumps cleaned good enough until I could return and do the job right, Jo and I loaded everything on the boat that was loose into our van and headed for home, tired but happy and still pleased with the new addition to our family.